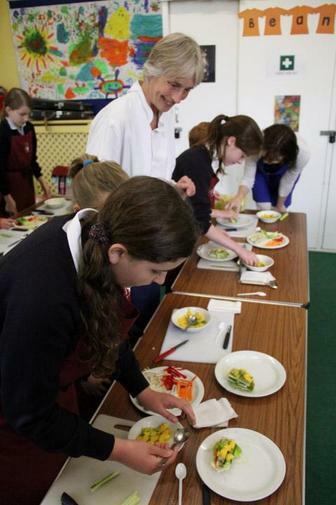 Members of the SNAG team enjoyed a really inspirational workshop with vegetarian chef Rachel Demuth in partnership with the Meat Free Monday organisation. Rachel owns a vegetarian restaurant and cookery school in Bath. She worked with the children making spaghetti vegetable salad with salsa verde, Vietnamese paper rolls and mango and kiwi salsa. Delicious! Rachel then held a session with our catering team to give them some ideas for our Meat Free Monday menus. For more great photos please visit the online gallery.